A US metal band have been barred from performing in Malaysia, after officials said the group could infringe the country's religious sensitivities. 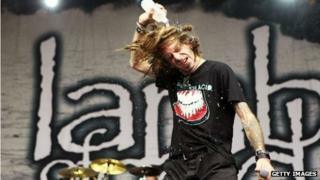 Lamb of God were originally due to play in Malaysia, a Muslim-majority country, on 28 September. However, the Communications and Multimedia Ministry has refused to grant the band a permit. The concert organiser said that the band and the metal genre had been "greatly misunderstood". Last week, the Department of Islamic Development also objected to the group's performance, saying that the music the group performed mixed metal songs with verses from the Koran, Malaysian newspaper The Star reported. In a statement Lamb of God said: "It is very evident (and a bit frustrating) that the groups, parties and powers that have taken the most offense to our music and lyrics have themselves only made a passing glance at the content and meanings of those songs." "We would invite anyone offended by our music to engage in a discussion regarding the true motivations behind our work, especially before publicly slandering us based on assumptions and shallow misinterpretation," it added. In 2010, band frontman Randy Blythe was accused of manslaughter after allegedly pushing a fan off the stage during a concert in the Czech Republic. The fan injured his head when he fell and died weeks later. Mr Blythe was acquitted by a Czech court in March. Malaysia has banned other shows by Western performers in the past. In 2012, US singer Erykah Badu's concert was banned after a photo showed her with "Allah" tattooed in Arabic on her upper body. In 2006, the organisers of a Pussycats Dolls concert were fined for flouting decency laws.